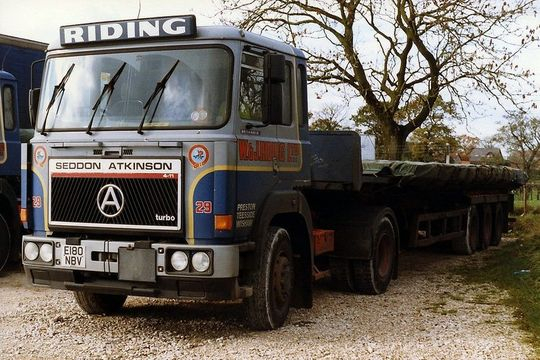 The Seddon Atkinson 4-11 Series, launched in 1987, was just a variant on the previous 401 Series with very little difference to the cab or running gear. 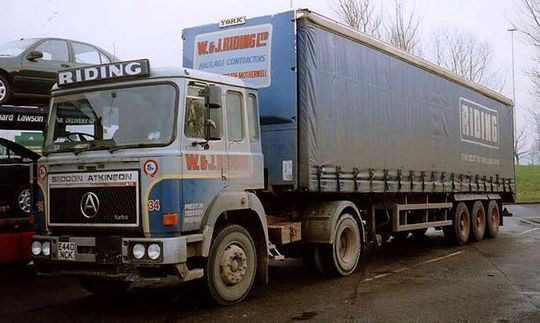 Although 4-11 production only lasted for just over a year W & J Riding introduced quite a number of them into their ever-growing fleet from August 1987 through to the end of its production run in late 1988 after which the 4-11 time was replaced by the Seddon Atkinson Strato range. The first Seddon Atkinson 4-11 Series 4x2 tractor unit to enter service with Riding's was Reg No E600 DCK Fleet No 54 'Mercury'. Registered new on the 1st of August 1987 it was one of the last 16 litre Gardner engined tractor unit's to come off the production line at the now long gone Seddon Atkinson factory at Oldham in Lancashire. Driven from new by Howard Quick it is pictured here parked up on the M62 Hartshead Moor service area in West Yorkshire while coupled up to a forty foot tri-axle flat trailer loaded with steel plate. Driven from new by Howard Quick, Seddon Atkinson 4-11 Series 4x2 tractor unit Reg No E600 DCK Fleet No 54 'Mercury' had the honour of being the first 4-11 to enter service with Riding's. Also it was one of the last 16 litre Gardner engined tractor unit's to come out of the now long gone Seddon Atkinson factory at Oldham in Lancashire. Registered new on the 1st of August 1987 it is seen here in the depot at Longridge, assigned to the general haulage fleet, fully loaded and waiting for the off. 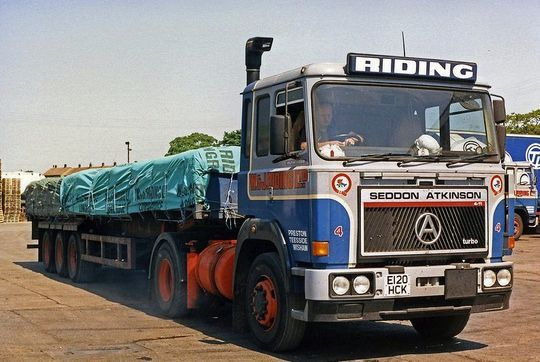 Another shot of Seddon Atkinson 4-11 4x2 tractor unit Reg No E600 DCK Fleet No 54 'Mercury' which was registered new by Riding's on the 1st of August 1987. 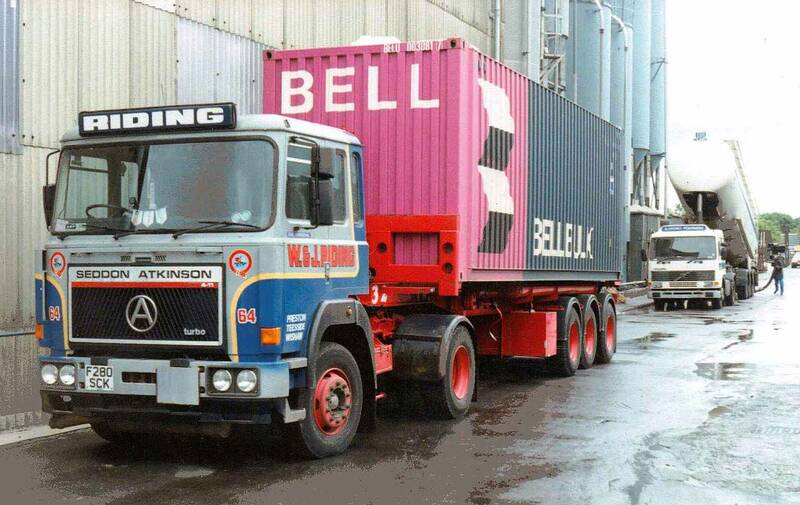 Driven from new by Howard Quick it is seen here parked up in Longridge depot in 1988 while coupled up to one of the company's tri-axle trombone 40 - 60 foot extending flat trailers loaded with sheet steel from the British Steel Corporation plant at Motherwell. 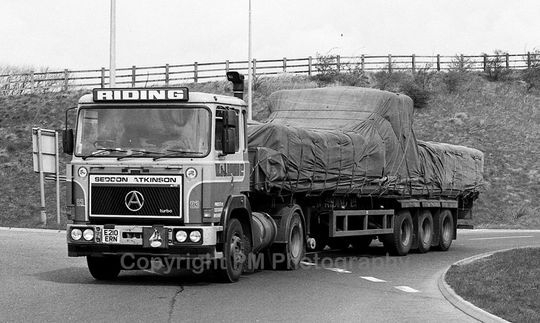 Seddon Atkinson 4-11 4x2 tractor unit Reg No E210 ERN Fleet No 50 'Evening Star', a brand new addition to the fleet on the 1st of September 1987, was driven from new by Jack Moon. 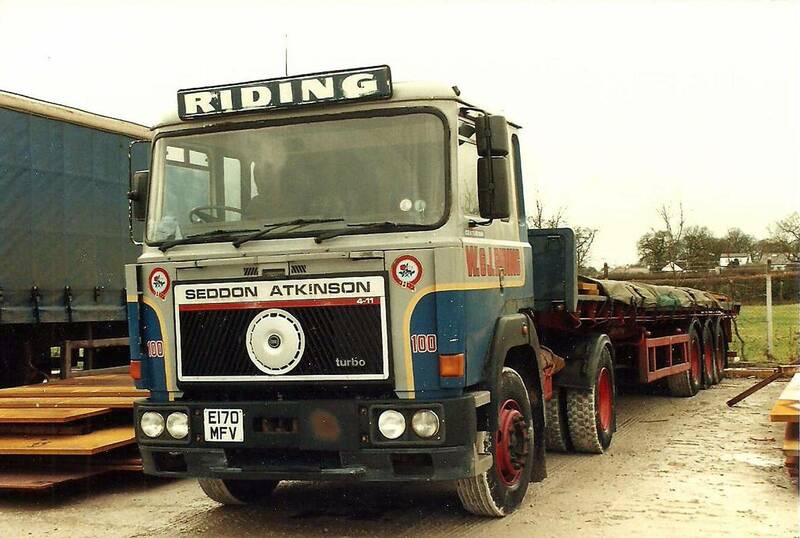 This was one of a pair of Seddon Atkinson 4-11 tractor units in the fleet at that time that were powered by the larger 16 litre Gardner 6LYT 320 bhp engine. This was due to the fact that Gardner were unable to supply Riding's with their preferred choice of the 6LXDT 290 bhp engine due to high demand. E210 ERN is pictured hauling a tri-axle trailer with a well sheeted and roped load of sacks with the double deck hump correctly positioned in the center of the trailer to be sure of correct weight distribution. Another shot of Seddon Atkinson 4-11 4x2 tractor unit Reg No E210 ERN Fleet No 50 'Evening Star' which was a brand new addition to the fleet on the 1st of September 1987. Seen here parked up for the weekend in the depot at Longridge it is coupled to a tri-axle flat trailer loaded with sheet steel from the British Steel Corporation plant at Motherwell. 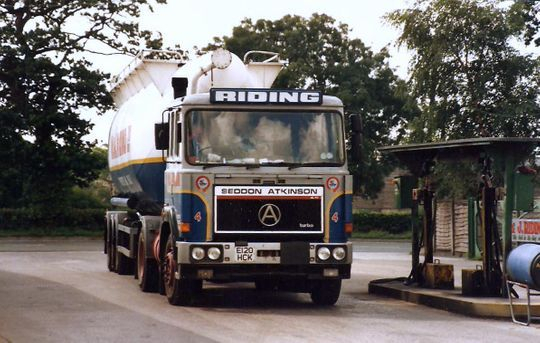 An on the road shot of Seddon Atkinson 4-11 4x2 tractor unit Reg No E920 GCK Fleet No 59 'Shooting Star' which was another brand new addition to the fleet in 1987. Registered new on the 1st of September that year, at a cost of £27,459 48p plus vat, it was powered by a Gardner 6LXDT engine. It is pictured here hauling a 40 foot tandem axle step frame curtain-sider trailer in the contract livery of Timax/Bainbridge Exhaust Products. Out based at Luton it was driven on days by Jim Lewis and on nights by Dave Reed. 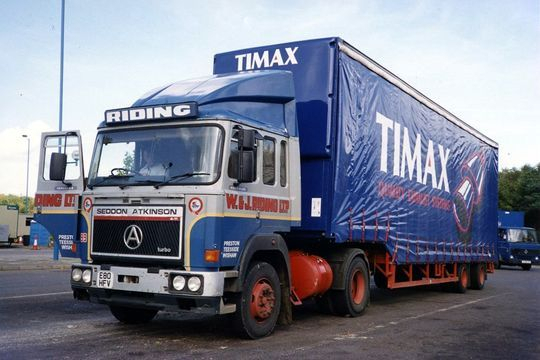 On days it tipped it's Timax curtain-sider at Southampton in the morning and in the afternoon it tipped one at Redhill in Surrey. 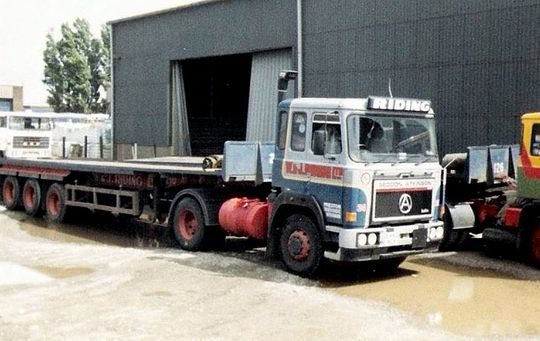 On nights it would return to Longridge with one of the empties and then take a loaded one back for the morning, with a Longridge based unit taking down another trailer for it to tip in the afternoon. In August 1993, when only six years old, it was stolen while parked in Luton resulting in the vehicle suffering damage and was broken up. 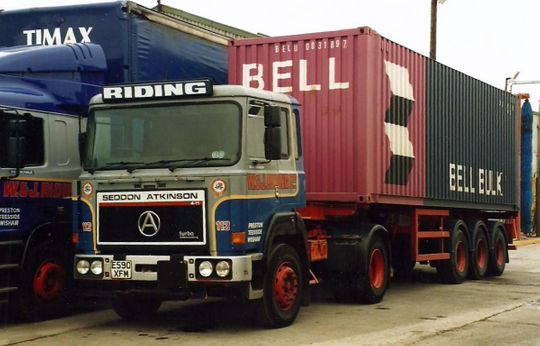 Another of the many brand new Seddon Atkinson 4-11 4x2 tractor unit's introduced into the fleet during 1987/8 was Reg No E590 XFM Fleet No 113 'Buccaneer'. 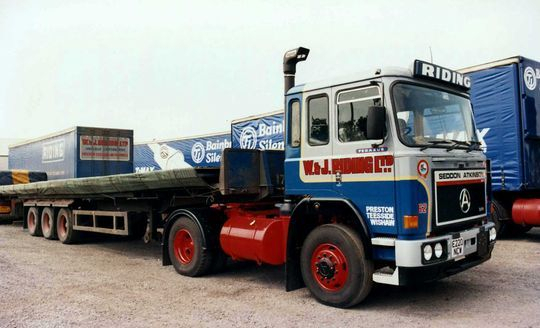 Registered new on the 2nd of October 1987 it is seen here coupled to a tri-axle forty foot trailer loaded with steel plate form the British Steel Corporation plant at Ravenscraig in Scotland. Marcus Lester from Bristol took this picture in 1988 while on a weekend visit to Riding's depot at Longridge. Another shot of Seddon Atkinson 4-11 4x2 tractor unit Reg No E590 XFM Fleet No 113 'Buccaneer'. Registered new by Riding's on the 2nd of October 1987 it was assigned to the general haulage fleet were it is seen here coupled up to a 33 foot tri-axle skelly trailer with a standard 30 foot Bell container on board. 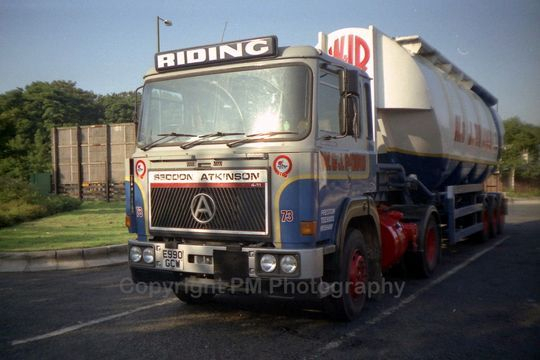 An on the road shot of Seddon Atkinson 4-11 4x2 tractor unit Reg No E590 XFM Fleet No 113 'Buccaneer'. 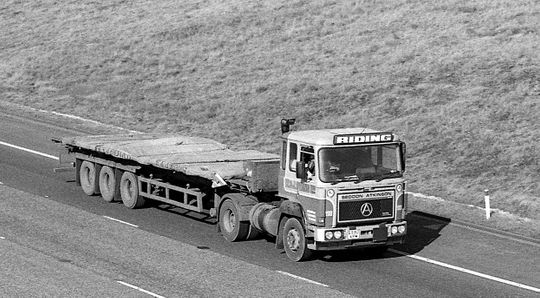 Registered new on the 2nd of October 1987 it is seen here heading South on M6 in Cumbria hauling a forty foot tri-axle trailer loaded with steel plate form the British Steel Corporation plant at Ravenscraig in Scotland. Seddon Atkinson 4-11 4x2 tractor unit Reg No E990 GCW Fleet No 73 'North Star' was another brand new addition to the fleet on the 2nd of October 1987. It is pictured here while assigned to Riding's powder tanker division hauling one of the company's 1450 cu ft Crane Fruehauf built non tipping powder tanker's. 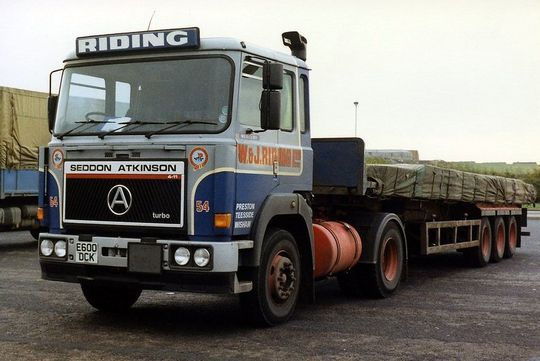 A later shot of Seddon Atkinson 4-11 4x2 tractor unit Reg No E990GCW Fleet No 73 'North Star' which was a brand addition to the fleet on the 2nd of October 1987. It is seen here parked outside the garage at Longridge depot towards the end of it's working life at Ridings in December 1995. 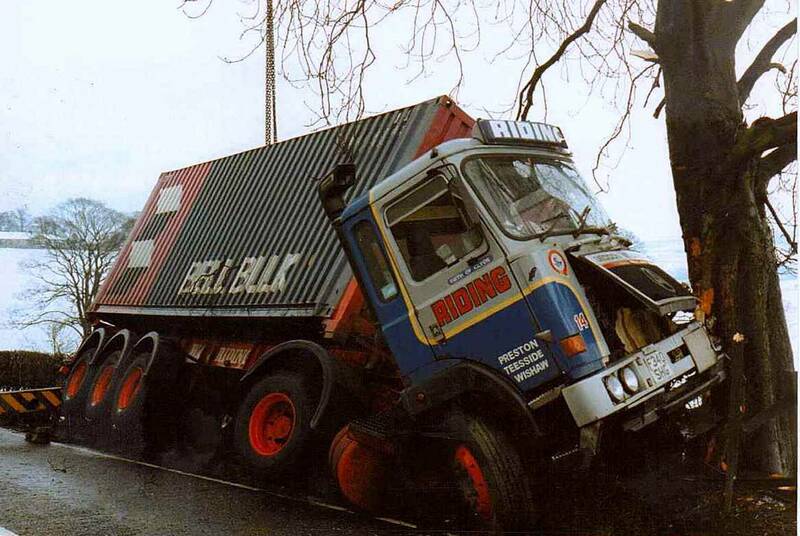 Within a few months of this picture being taken E990 GCW was withdrawn and scrapped. 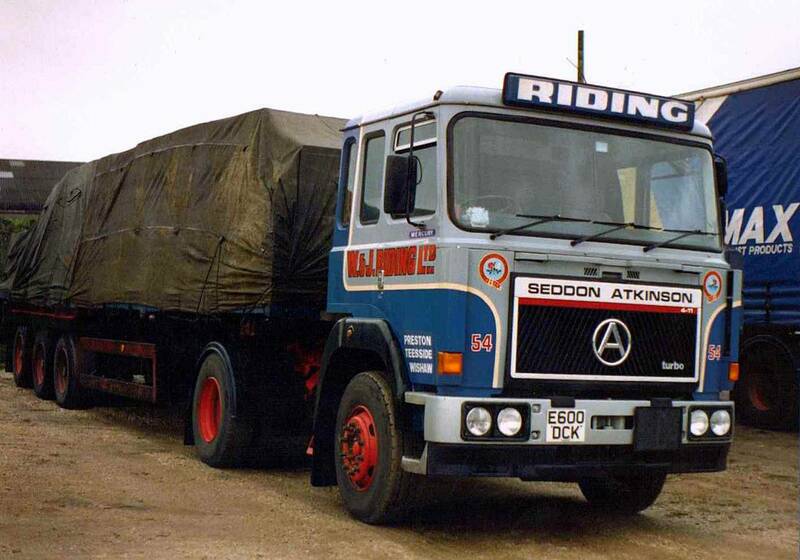 Seddon Atkinson 4-11 4x2 tractor unit Reg No E80 HFV Fleet No 99 'Hercules' was powered by a Gardner 6LXDT engine. Registered new on the 17th of October 1987, at a cost of £27,459 plus vat, it is seen here on the pumps at Longridge with driver Alan Margerison fuelling it up. 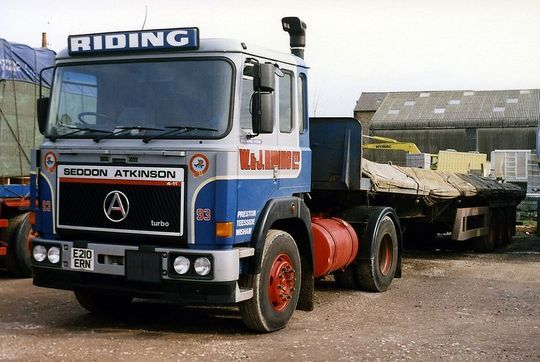 Originally, when new, E80 HFV had been out based at Glasson Dock at the Timax plant were it was driven on days by local man Ted Sandham, who did three trips to Squires gate with manufactured products, and on nights it was driven by Fred Hurdwho did a Falkirk trailer swap. In March 1990 it suffered an engine failure and the engine out of D70 XBV, which had been rebuilt by Gardner's, was fitted into it. On the 13th of February 1995, after almost eight years service, E80 HFV was sold on to J.C. Commercials of Liverpool for the sum of £2,750 plus vat. Another shot of Seddon Atkinson 4-11 4x2 tractor unit Reg No E80 HFV Fleet No 99 'Hercules' pictured in the depot coupled to a tandem axle 40 foot curtainsider trailer. Registered new on the 17th of October 1987, at a cost of £27,459 plus vat, E80 HFV was originally out based at the Timax plant on Glasson Dock were it was driven on days by local man Ted Sandham, who did three trips to Squires gate with manufactured products, and on nights it was driven by Fred Hurd who did a Falkirk trailer swap. In March 1990 it suffered an engine failure and the engine out of D70 XBV, which had been rebuilt by Gardner's, was transferred into it. Seddon Atkinson 4-11 4x2 tractor unit Reg No E80 HFV Fleet No 99 'Hercules' is pictured here again this time parked up on the M6Forton Service area in Lancashire as driver Ted Sandham takes a break. Coupled to a 40 foot step frame curtain sider trailer E80 HFV was originally out based at the Timax plant on Glasson Dock near Lancaster were it was driven on days by local man Ted Sandham. Ted did three trips to Squires Gate on days, with manufactured products, while on nights it was driven by Fred Hurd who did a Falkirk trailer swap. 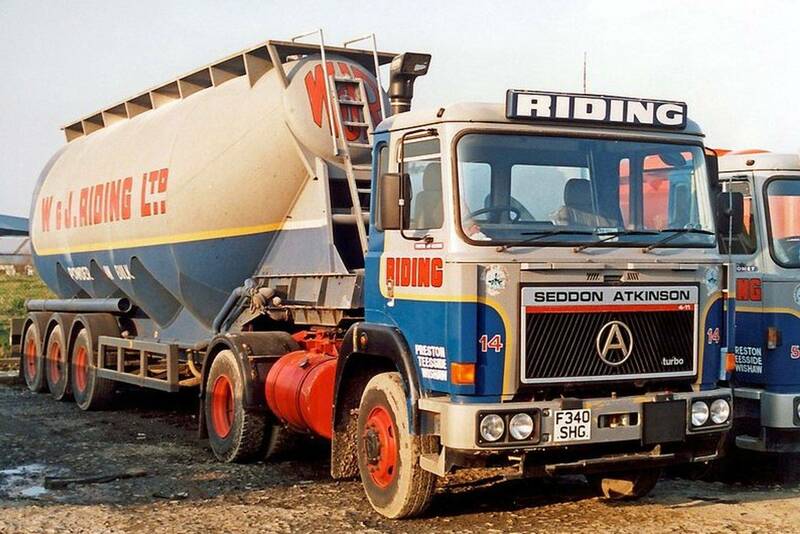 Seddon Atkinson 4-11 4x2 tractor unit Reg No E120 HCK Fleet No 4 'Pathfinder' was another of the large batch of Seddon Atkinson 4-11 tractor units to enter service during 1987/8. Registered new on the 1st of October 1987 at a cost of £27,459. 48p + vat it was powered by a Gardner 6LXDT engine in line with a Fuller gearbox and Eaton rear axle. 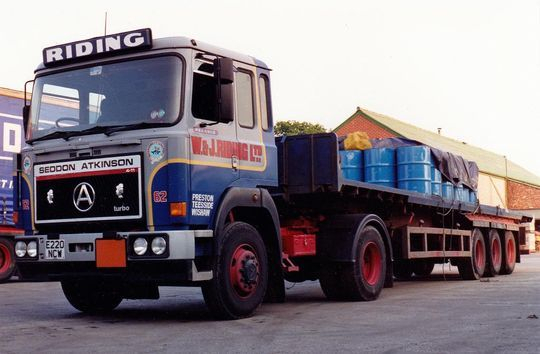 Driven from new by Bill Cookson it is seen here on the 13th August 1994 about to pull onto the fuel pumps after arriving back at the depot at Longridge while hauling a tri-axle powder tanker. 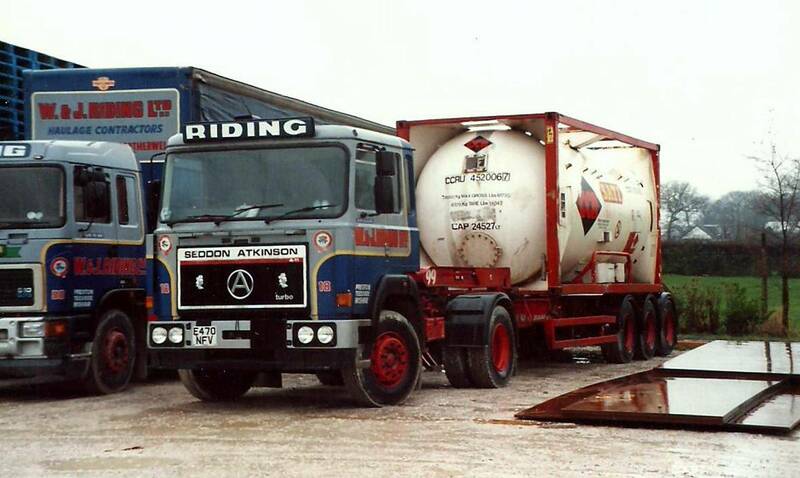 An excellent on the road shot of Seddon Atkinson 4-11 4x2 tractor unit Reg No E120 HCK Fleet No 4 'Pathfinder' seen here hauling powder tank No 157, a Murfitt 1700 cubic foot capacity tri-axle tanker. Driven by Bill Cookson it is pictured here on the old A17 passing through the village of Leadenham in Lincolnshire returning empty to Runcorn having delivered a full load of Corvic plastic powder to Anglian Windows in Norwich. Coincidentally Tom Riding was based just up the road from this location at RAF Cranwell from 1954 to 1956 during his national service and used to frequent the public house in the picture. Another excellent shot of Seddon Atkinson 4-11 4x2 tractor unit Reg No E120 HCK Fleet No 4 'Pathfinder'. Registered new on the 1st of October 1987 it is pictured here about to leave Longridge with a 24 ton load of bagged cement from the Castle Cement plant at Clitheroe destined for Coatbridge in Scotland. Seddon Atkinson 4-11 4x2 tractor unit Reg No E580 HFR Fleet No 66 'Sir Winston' was one of several 4-11 tractor unit's registered new to Riding's on the 1st of November 1987. Powered by a Gardner 6LXDT engine in line with a Fuller twin speed gearbox it is pictured here in the depot coupled to a Timax liveried 40 foot step-frame trailer loaded with steel cages full of exhaust systems. Seddon Atkinson 4-11 4x2 tractor unit Reg No E170 MFV Fleet No 100 'Centurion', registered new on the 10th of April 1988 was powered by a Gardner 6LXDT engine rated at 290 bhp in line with a Fuller twin speed splitter gearbox. Pictured here in Riding's depot at Longridge in 1988, when only a couple of months old, it is coupled up to a forty foot tri-axle trailer loaded with sheet steel from the British Steel Corporation plant at Motherwell. 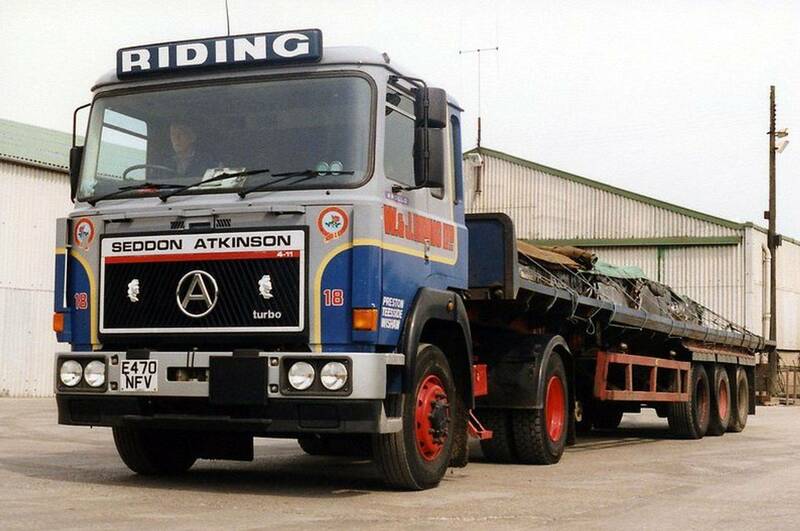 Another shot of Seddon Atkinson 4-11 4x2 tractor unit Reg No E170 MFV Fleet No 100 'Centurion'. Registered new on the 10th of April 1988 it is seen here a number of years later in 1995, still hauling steel, but having lost its original Atkinson 'A' grille badge which has been replaced by, of all things, a Fiat car wheel trim. Seddon Atkinson 4-11 4x2 tractor unit Reg No E420 MFR Fleet No 101 'Implacable' was another of several Seddon Atkinson tractor unit's that Riding's registered new on the 10th of April 1988. This tractor unit, driven from new by Rex Rich, was one of a batch fitted with the Gardner 6LXDT engine rated at 290 bhp in line with a Fuller twin speed splitter gearbox. 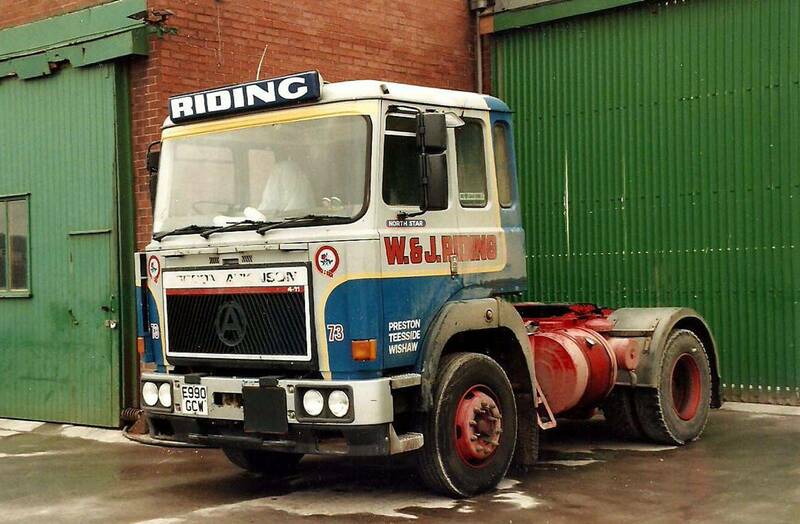 Parked up at Longridge it is seen here in a rather filthy state after it's journey down from Scotland loaded with sheet steel from the British Steel Corporation plant at Motherwell which was big traffic for Riding's in those days. 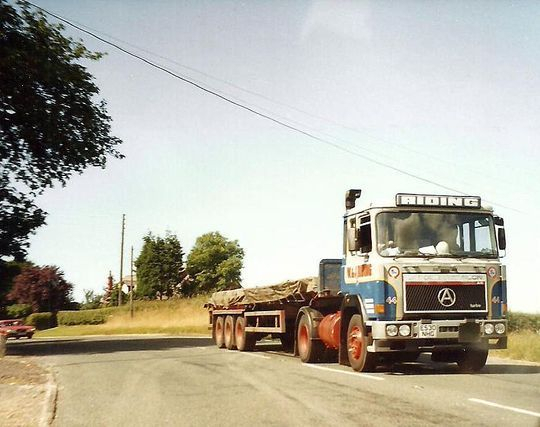 A nice on the road shot of Seddon Atkinson 4-11 4x2 tractor unit Reg No E420 MFR Fleet No 101 'Implacable'. 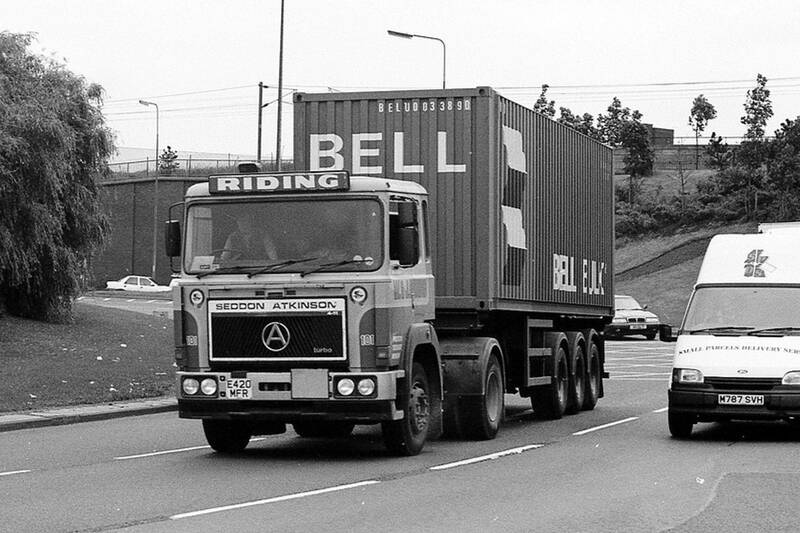 Driven from new by Rex Rich it is seen here in Leeds on the Armley gyratory system heading out towards the M621 motorway while hauling a 33 foot tri-axle skelly trailer with a 30 foot Bell Line container on board. An unusual shot of Seddon Atkinson 4-11 4x2 tractor unit Reg No E420 MFR Fleet No 101 'Implacable' seen here out in the sticks in East Yorkshire. 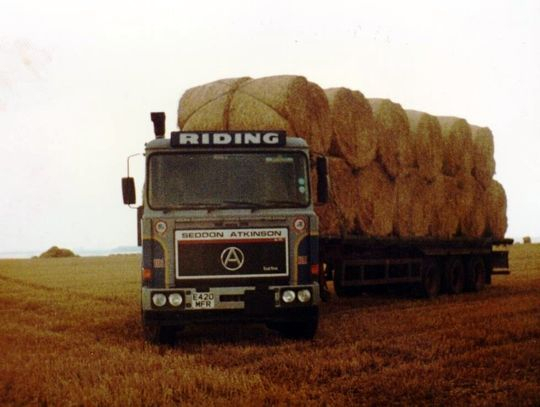 The picture, taken by driver Rex Rich shows it with a full load of straw bales. We wouldn't normally handle this material but it was done periodically for a very good friend of mine, the late Harvey Kaye of Brindle. Rex could handle it but it was a very difficult place to get into to unload. 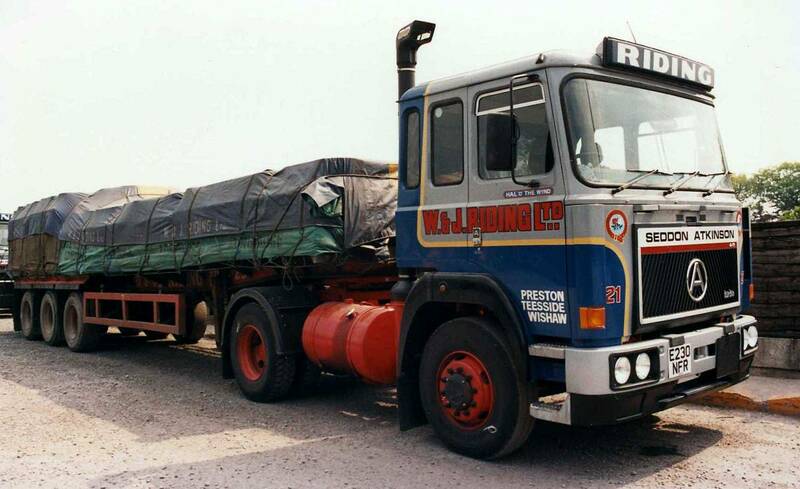 Powered by a Gardner 6LXDT engine rated at 290 bhp, in line with a Fuller twin speed splitter gearbox, Seddon Atkinson 4-11 4x2 tractor unit Reg No E220 NCW Fleet No 62 'Pegasus' was registered new on the 1st of May 1988. Driven from new by Tom Dewhurst, who was a driver with Riding's for over 40 year's, it is pictured here parked up in Longridge depot in 1988 when brand new. Coupled up to one of the company's tri-axle flat trombone 40 - 60ft extending trailers it is loaded with sheet steel from the British Steel Corporation plant at Motherwell which was regular traffic for Riding's at that time. Another shot of Seddon Atkinson 4-11 4x2 tractor unit Reg No E220 NCW Fleet No 62 'Pegasus' which was registered new on the 1st of May 1988. Driven from new by Tom Dewhurst, a driver with Riding's for over 40 year's, it is seen here in Longridge during a load transfer of 40 gallon drums of Cereclor (chlorinated paraffin). 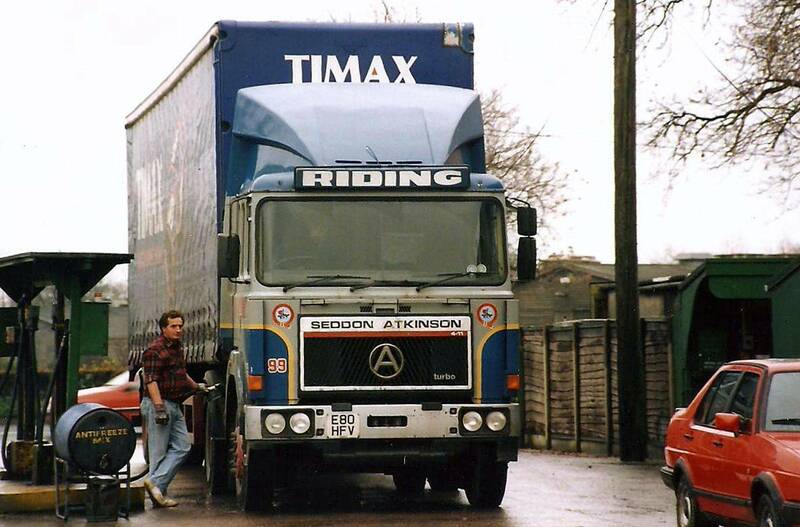 Seddon Atkinson 4-11 4x2 tractor unit Reg No E180 NBV Fleet No 29 'Brittannia' was powered by a Gardner 6LXDT 290 engine in line with a Fuller twin splitter gearbox. Registered new on the 1st of May 1988 at a cost of £29,355 22p plus vat it was driven from new by Harold Hornby. Pictured here in the yard at Longridge, with a load of steel plate from the British Steel Corporation plant at Motherwell, E180 NBV remained in service with Riding's until the 27th of February 1996 when it was withdrawn and sold on to J.C. Commercials of Bootle for £2,150 plus vat. 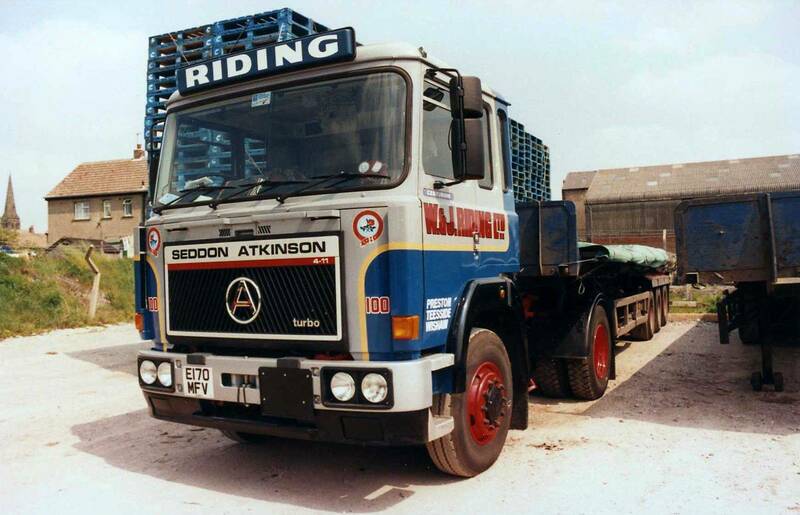 Seddon Atkinson 4-11 4x2 tractor unit Reg No E230 NFR Fleet No 21 'Hal O The Wynd ' was another Sed Atki in the fleet registered new on the 1st of May 1988. Powered by a Gardner 6LXDT engine rated at 290 bhp, in line with a Fuller twin speed splitter gearbox, it was driven from new by Kenneth Fell. Pictured here in Riding's depot at Longridge in 1988, when only a couple of months old, it is coupled up to a Crane Fruehauf forty foot tri-axle trailer with a nicely sheeted and roped load of drums on board. 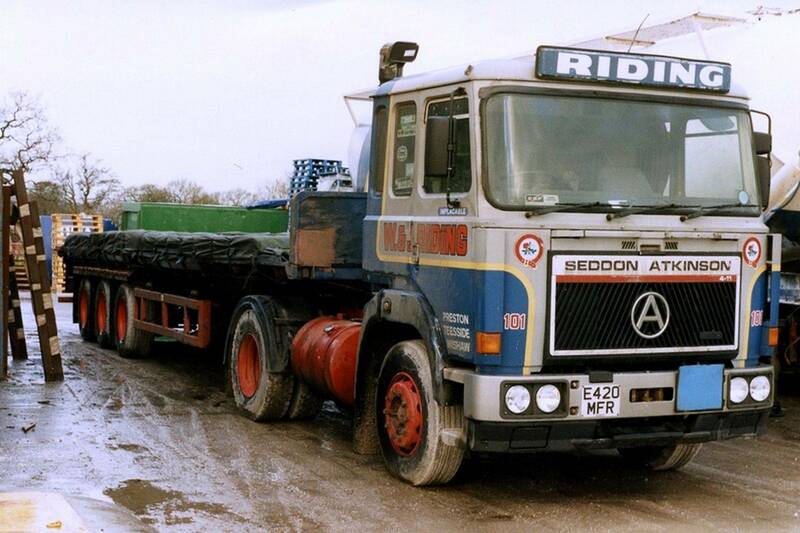 Seddon Atkinson 4-11 4x2 tractor unit Reg No E440 NCK Fleet No 34 'Black Prince ' was another of the batch of Seddon Atkinson tractor units introduced into the fleet in the Spring of 1988. Registered new on the 1st of May 1988 at a cost of £29,355 plus vat it was powered by a Gardner 6LXDT engine and driven from new by Tim Dewhurst. 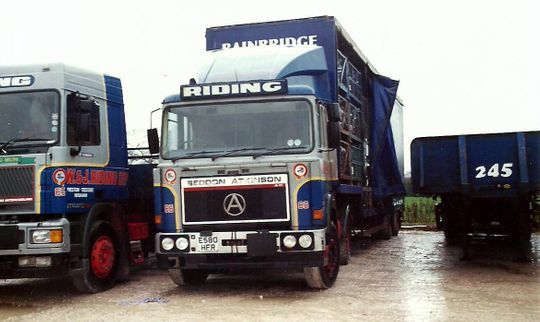 Spending all its life on the general haulage fleet it is seen here coupled to one of Riding's 40 foot Crane Fruehauf tri-axle trailers retro fitted with a pillar-less curtain-sider body built by York Trailers. 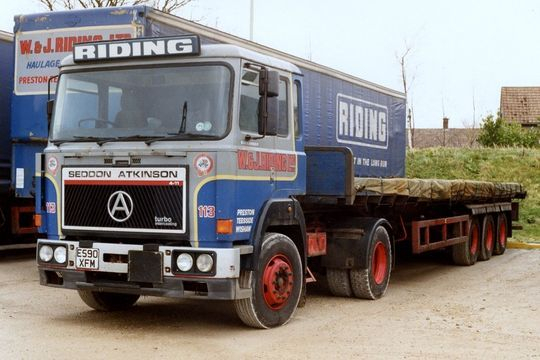 Another shot of Seddon Atkinson 4-11 Series 4x2 tractor unit Reg No E440 NCK Fleet No 34 'Black Prince' which was registered new on the 1st of May 1988 at a cost of £29,355 plus vat. Fitted with the Gardner 6LXDT engine in line with a Fuller twin splitter gearbox this was our standard specification at the time. Spending its entire life on general haulage it was driven from new by Tim Dewhurst who was another long time serving Riding's man. Tim also met his future wife Susan at Riding's were she was working in our offices at the time, lucky man". After eight years in the Riding fleet E440 NCK was sold on to J.C. Commercials of Liverpool for £1,500 plus vat on the 25th of July 1996. Seddon Atkinson 4-11 4x2 tractor unit Reg No E530 NHG Fleet No 44 'Royal Star' was registered new on the 1st of June 1988 at a cost of £29,355.22p plus vat. Powerd by a Gardner 6LXDT engine in line with a twin splitter gearbox it was driven from new by Bill Procter and remained in service with Riding's for 10 years until the 14th of June 1996 after which time it was sold on to local dealer Syd Hartley for £950 plus vat. "The trailer it is seen coupled up to had been fitted with a sliding curtain-side body by Nortec of Telford the intention being to carry canned goods to Scotland and return with steel plates. Unfortunately the scheme came to an abrupt end as we lost the Heinz traffic and the BSC plant closed down which was bad news at the time." An on the road shot of Seddon Atkinson 4-11 4x2 tractor unit Reg No E530 NHG Fleet No 44 'Royal Star' hauling a tri-axle flat trailer loaded with steel plate from the British Steel Corporation plant at Motherwell. 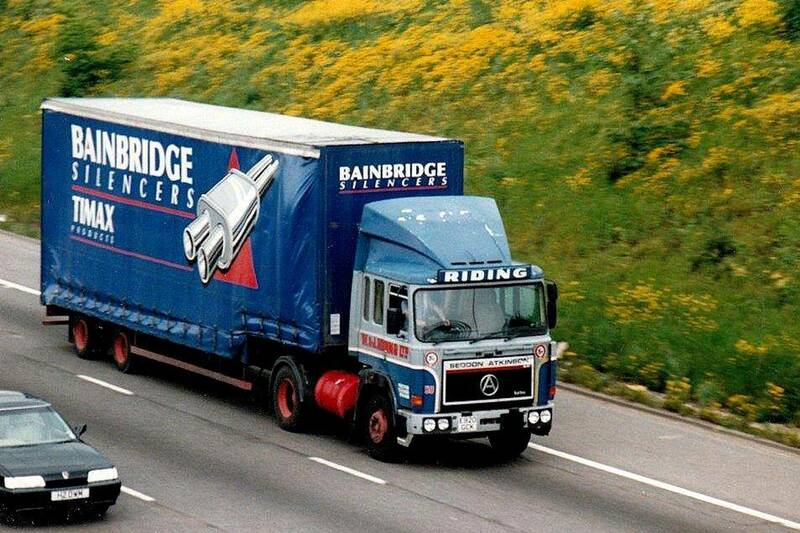 It is pictured here on the B5269 as it heads home to Longridge on the 13th of August 1994. 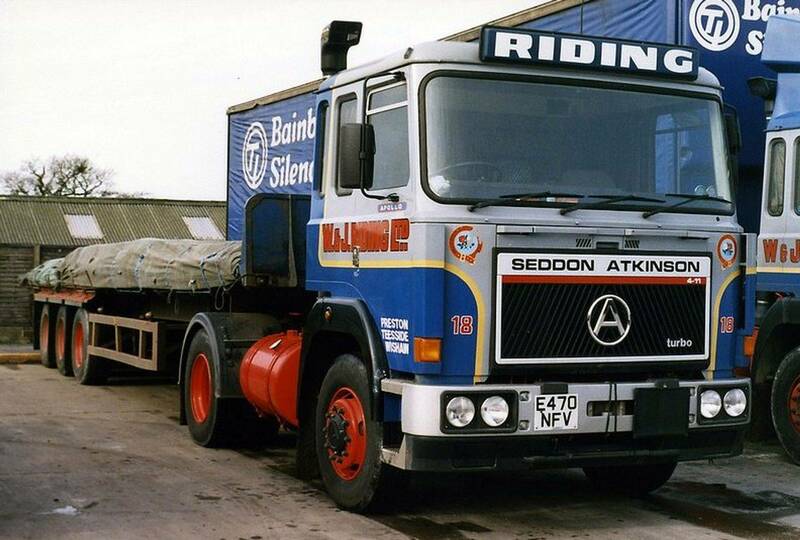 A quayside shot of Seddon Atkinson 4-11 4x2 tractor unit Reg No E530 NHG Fleet No 44 'Royal Star'. 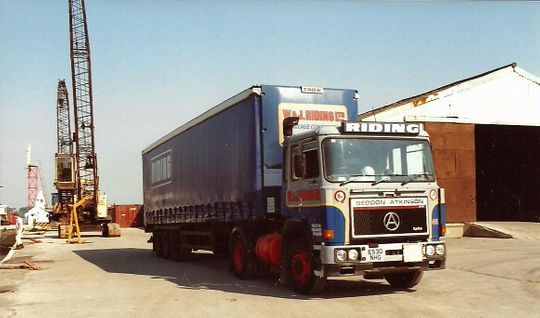 Registered new by Riding's on the 1st of June 1988, at a cost of £29,355.22p plus vat, it is pictured here when three years old on the 2nd of September 1991 at Glasson Dock next to a warehouse that was once used for Isle of Man traffic. 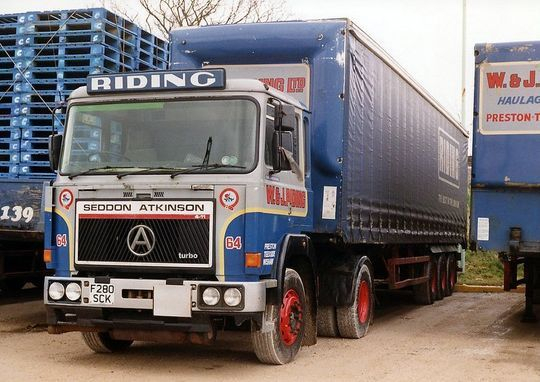 Seddon Atkinson 4-11 4x2 tractor unit Reg No E470 NFV Fleet No 18 'Apollo' was powered by a Gardner 6LXDT engine in line with a Fuller twin splitter gearbox. Registered new on the 1st of June 1988, at a cost of £29,355 plus vat, it was driven on a regular basis by John Fawcett a.k.a. 'Cumberland John'. It is seen here parked up in the depot at Longridge coupled to a forty foot tri-axle trailer loaded with steel plate from Scotland. E470 NFV was later sold on to J. C. Commercials of Liverpool for the sum of £1,500 plus vat on the 28th of September 1996. At this time Gardner's were not everyone's favorite engine and the premium prices that they once used to command were no longer available on the second hand market. 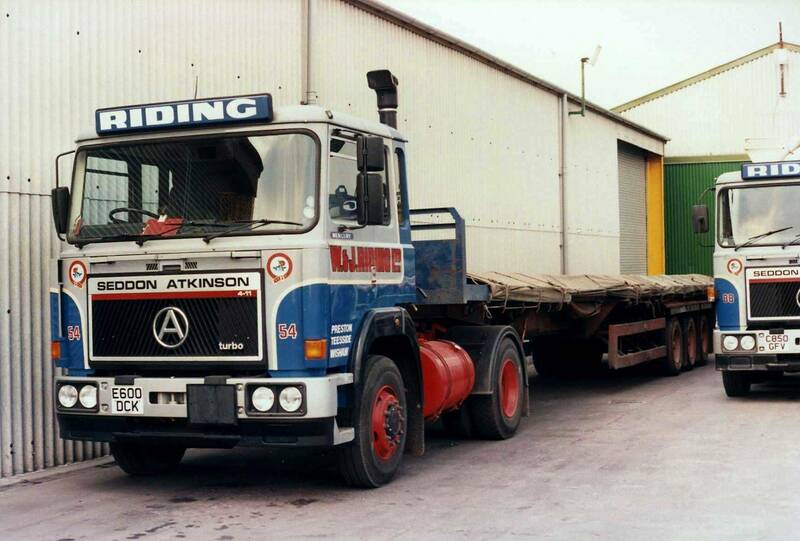 Seen here again is another fine shot of Seddon Atkinson 4-11 4x2 tractor unit Reg No E470 NFV Fleet No 18 'Apollo'. Powered by a Gardner 6LXDT engine in line with a Fuller twin splitter gearbox it was driven on a regular basis by John Fawcett a.k.a. 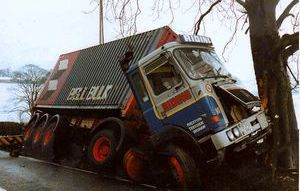 'Cumberland John', who can be seen in the cab at the wheel. 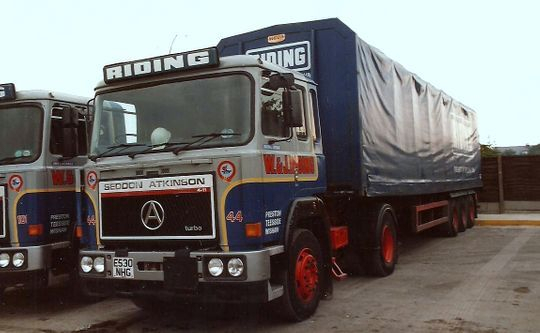 Another shot of Seddon Atkinson 4-11 4x2 tractor unit Reg No E470 NFV Fleet No 18 'Apollo' which was powered by a Gardner 6LXDT engine in line with a Fuller twin splitter gearbox. Driven on a regular basis by John Fawcett a.k.a. Cumberland John it is seen here parked up in the depot at Longridge while coupled up to a low centre of gravity tri-axle step frame trailer which was used to carry hazardous chemicals in 20 foot container tanks. Seddon Atkinson 4-11 4x2 tractor unit Reg No F280 SCK Fleet No 64 'Earl Marischal', registered new on the 1st of August 1988, was powered by a Gardner 6LXDT engine. Driven by Vernon Goodison it is pictured at Padiham about to discharge a 'bag in a box' using a tipping skeletal trailer complete with a rotary feeder at the rear of the trailer. Another shot of Seddon Atkinson 4-11 4x2 tractor unit Reg No F280SCK Fleet No 64 'Earl Marischal'. 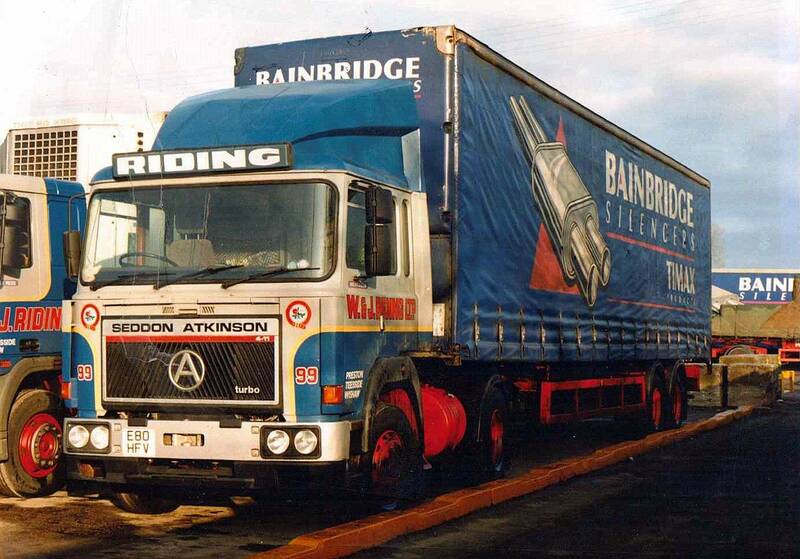 Registered new on the 1st of August 1988, and driven by Vernon Goodison, it is pictured parked in the depot at Longridge while coupled up to one of Riding's standard tri-axle 45 foot curtain-sider trailers a type of which Riding's had many in their fleet. Day cabbed Seddon Atkinson 4-11 Series 4x2 tractor unit Reg No F340 SHG Fleet No 14 'Firth of Clyde' was registered new on the 1st of September 1988 at a cost of £27,781 plus vat. Powered by a Gardner 6LXDT engine this particular tractor unit along with Reg No F110 SRN, which was registered on the same day, were the very last Gardner engined vehicles to leave the Seddon Atkinson factory. They were bought specifically to haul lime from Shap quarry in Cumbria to the British Steel Corporation plant at Ravenscriag in Scotland running 24 hours a day 7 days a week. Seen above parked up at Riding's Motherwell depot between shifts they could carry 25 tons payload with the Crane Fruehauf 1450 cubic foot non tipping tankers.